My niece Zoe, had never been snorkeling off a kayak before but the calm waters off Captain Cook Monument near Kona’s Kealakekua Bay seemed so inviting that she didn’t hesitate to don her fins and drop over the side. Holding onto the kayak while she adjusted her mask she tentatively placed her face in the water, her eyes immediately widening to the joy of becoming part of the undersea world of mermaids. When she was a toddler, her mother and I, her aunti, explained how we transformed into mermaids once we dove underwater. Back then, she would stand at the edge of the water holding my hand, and watching her mother swim out to sea, hoping for a glimpse of feet suddenly turning into a dolphin tail. Now too old for fairy tails, her teenage brain intuited the lessons of mermaids as she dipped into the world of mermaids. By the end of a day of snorkeling and kayaking off Hawaii’s Kealakekua Bay, she understood that you become something different when you leave the world of air breathing mammals and enter the sea. You become like a mermaid – half human, half fish – more capable of handling two realms of existence, more comfortable within your own skin and one with all of life once you enter the sea. You swim through the undulating colors of vibrant tropical fish schooling around you and become startling aware that much of the beauty of life remains hidden – something we must all seek out. You reach out to touch the yellow tang as it disappears behind lava and understand that you have a place upon the rock – hiding behind something that seems like an obstacle is for fish not mermaids. You gaze in wonder at the gentle Manta Ray soaring beneath you like a giant underwater kite that takes to the sky once in a while and a longing rises in you to transcend your own atmospheric boundaries as you feel the feel the rush of knowing that you can soar through life challenges and make dreams come true. You emerge from the sea more completely and complexly grounded in you. 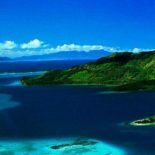 This entry was posted on January 22, 2019 by Crazi Culture in (me) Journey Recommendations, Crazi Cruises, Island Hops, and Underwater Destinations, Uncategorized and tagged Hawaii, kayaking, Kealakekua Bay, Kona, snorklle hawaii.